Judith Treanor is the Director and Founder of Temples and Markets an online only eCommerce business who are helping to trade artisans in South East Asia into a better life, and bringing unique products to a customer who wouldn’t otherwise find them. After 12 months of preparation the website launched in November 2015, and now has 15,000 on the email list, and anticipates a monthly revenue of $10,000 by Christmas 2016 heavily built on repeat purchases. Judith previously had an interior decoration and renovation project management company, and also worked in the buying and merchandising departments for House of Fraser. She has been a frequent traveler to southeast Asia for about twenty years, and would often come back wearing a piece of jewelry or carrying a handbag that she’d bought on the trip. People would want to know where she got it, and their faces would fall when they learned that she had bought it somewhere like Thailand. She came up with the idea for Temples and Markets. Judith relies on those close to her for help. Her stepfather assists with order fulfillment, while her son helps with Pinterest, Instagram, and the back-end work of uploading products. She also utilizes a freelancer for SEO, and has had an intern in the past. The win-win of making a positive difference in the lives of the artisans while bringing beautiful jewelry to the customers. Listen to hear more about how…. Judith markets with the current big movement towards ethical shopping and sustainable manufacturing worldwide in mind. 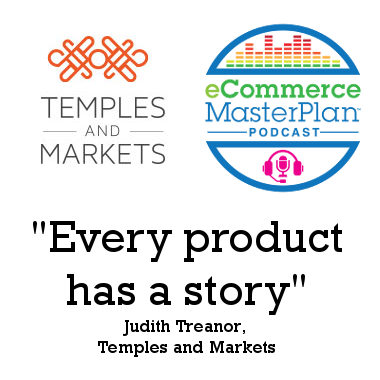 She markets words like “sustainable,” “recycle,” and “ethical.” The success of Temples and Markets is heavily based on repeat purchases, possibly because Judith has tried to create a beautiful shopping experience. The products are beautifully wrapped, and a handwritten note and surprise gift is included. Judith sends two emails per week to her subscriber list. She gained many subscribers through opt-in surveys, and the result has been generally positive. Nervous of scaring your customers off with too much email? Listen to learn how beneficial email has been to Judith. If you’re passionate about something, just go for it. Don’t wait until the website is perfect. A really interesting podcast, thank you. A quick question Judith mentions that she primarily uses opt-in surveys. I am assuming she is using a service to carry out the surveys. Do you know what service this is? Can I just clarify the above question I don’t mean the tool as in survey monkey etc. She is clearly using a service that delivers the survey to a wider audience than she has at the moment. It is that, that interests me. I’m not sure of the exact one Judith was using – but I’ve messaged her to find out. In the meantime in the UK Rokt do a similar thing. My pleasure Dave – it’s what we’re here for!